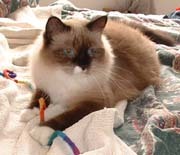 The new issue of Cats USA 2004 just came outâ€”you’ll find my photo on page 103! 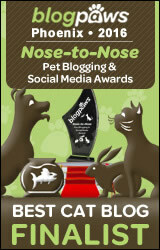 This is very excitingâ€”it means I’m now a star! We just got our first bag of free IAMS cat food. My human picked up the Lamb & Rice flavor. I was dubious about it at firstâ€”my human has brought home some awful dried cat food in the past. But this stuff was great! All of us love it. I think we can live with IAMS for breakfast for the next year (just so long as we keep getting the Nutro chunks for dinner). 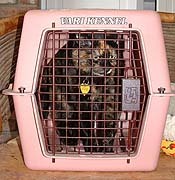 We also have a new cat carrier. There were a bunch of really horrible fires in Southern California in October, and even though none of them were near our house my human was concerned because we only have two cat carriersâ€”one for Binga and one for me. Boodie, being a foster, never had her own. So my human’s boyfriend brought home an old one from the vet clinic where he works. It’s actually bigger and sturdier than either of ours, but Boodie hates it. 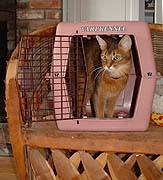 Binga likes it, thoughâ€”she even let the humans shut the door on her. 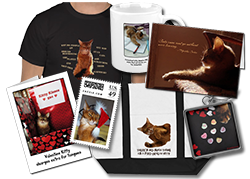 After Binga’s brave display, I decided to check it out, but I waited ’til no one was looking (or at least I thought no one was lookingâ€”the fact that there are photos proves that there’s a snoop around here somewhere). More work is being done on the house. This tall guy came in and started painting the doors in the hallway. 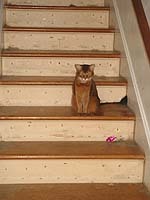 He had to take them outside and sand them and Binga thought that would be her chance to run down in the basement again. The last time she did this, she got under the house and it took the humans forever to retrieve her. Well, she was out of luck this timeâ€”the painter taped plastic over the basement doorway. 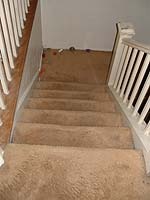 Then another guy came by and started tearing up the carpet on the stairs. This kind of bummed me out because the carpet made a nice surface to claw. My human didn’t like the carpet. She’s been complaining about it for as long as I’ve known her. 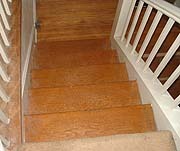 I have to admit the staircase looks better without the carpet, and it isn’t even finished yet. 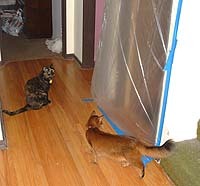 While the guy was pulling up the carpet and removing the pointy staples and nails, we cats got locked in the bedroom. We hate when that happens. My human pulls out the toys in a vain attempt to placate us. Well, actually it’s not always such a vain attempt. But you can see that Boodie’s heart isn’t in it. 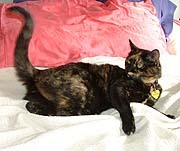 All this has completely frustrated Binga – you can tell when she’s irritated because her tail starts flipping. She went on a rampage the moment she was free to roam the house again. She caused more trouble in the past couple of weeks than she has all year! One night she went in the downstairs bathroom and played with that roll of paper the humans keep in there. 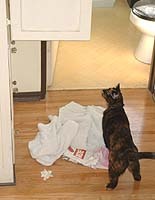 Then she jumped in the linen closet and pulled out some towels. She was proud of her work. The tile in the upstairs bathroom wasn’t done a moment too soon. I can’t say that Binga has calmed down now that she’s got the bathtub back, but at least she can take out her aggressions by rolling around in it again. She jumps in the bathtub every morning. Now she spends the afternoons napping instead of creating mischief.